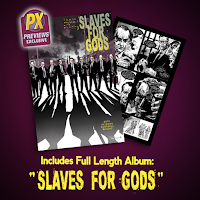 Fellowship Previews: SLAVES FOR GODS Graphic Novel to be Published by Hermes Press! Cover art A by Jock (All Star Batman, Wytches) comes with a digital download of “Teenage LSD”, an analog exploration into dreamy 60's psych pop, with music contributions by members of The Polyphonic Spree, Leon Bridges band, and the Toadies. 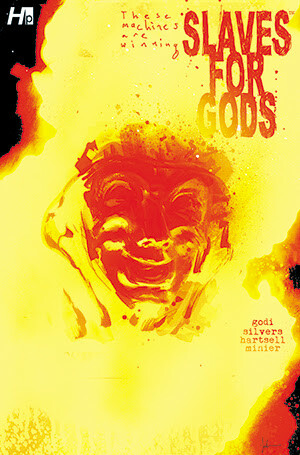 These Machines are Winning presents: Slaves For Gods Volume One ; Cover A ISBN #978-1-61345-130-4 ; Cover B Variant ISBN #978-1-61345-131-1 ; Black And White & Color; Hardcover ; 128 pages; Slaves For Gods art by Aaron Minier ; Story by Jason Godi, Dylan Silvers and Ryan Hartsell ; Cover A by Jock and Cover B Variant (PREVIEWS EXCLUSIVE) by Charlie Adlard ; Each edition comes with a unique music digital download of a full-length album by These Machines are Winning ; $19.99 each.